So all joking aside for Henry Bond who must be bored with the 007 jokes, but we couldn’t resist that one! 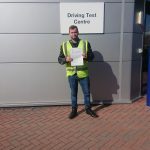 Well done though for passing your DAS first time round, now back to jolly Tunbridge Wells for a celebratory Kentish ale maybe?!!!! Everyone was extremely welcoming and a good laugh at MTS Hassocks. Passed my DAS first time today with Ric as my instructor. Have already recommended MTS to a friend and would to anyone else looking to do their DAS. Ric gave amazing and enjoyable training with great advice as well as being a really nice guy. A pleasure to be taught by. Will undoubtedly have, “the soothing tones of RicFM” in the back of my head when I’m riding from now on. Will be going back to do an advanced course once I buy my bike. Thanks again for your help and see you soon!